In more than 40 years of towing we’ve gotten cars and trucks out of some pretty tight spots. 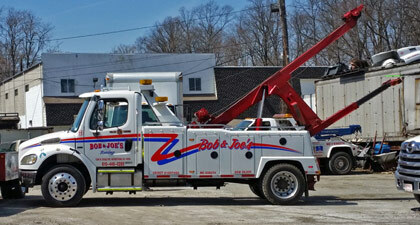 Bob and Joe’s PA towing fleet is ready 24 hours a day to winch and recovery any vehicle from almost anywhere. Our experienced drivers have pulled cars from creeks and trucks from roadside ditches. Call us if you are in an accident and your car is in a difficult to reach location. We are contracted often by the local and state police to recover vehicles that have left the road. Using winches and other equipment we have recovered vehicles from just about every possible situation. No job is too difficult for us and that is why emergency responders call us to recover cars that have gone off the road. You can see in our slideshow how we were able to assist the Havertown Police Department and Fire Company in getting a car out of a creek. Using a winch we were able to get the vehicle out of the water without further damaging the vehicle. Our years of experience in vehicle recovery allow us to tackle any job, anywhere.